If you have upgraded your Jeep to larger tires or just like the look & added safety of LED technology ProComp offers this great LED Circular 3rd Brake Light. This circular ring design is made from a durable black polypropylene mounting plate which is IP-67 waterproof/dustproof/shockproof rated. It features 85, 5-watt LED's which will surely notify drivers behind you when you are braking. Designed to work with both factory and most aftermarket tire carriers holding 15" or larger diameter wheels. DOT approved! Get Noticed: With 85, 5-watt instant-on LED's drivers behind you will take notice immediately when you hit the brakes. Multiple Applications: Works great on Jeep models from 1976 CJ to the latest Wrangler JL and all CJ/Wrangler applications in between. Long Lasting Quality: Features a Limited Lifetime Warranty! 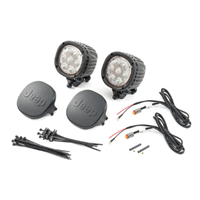 Off-road Light Kit provides that extra light source needed for safe off-road driving. Each light produces 4,800 Lumen, are water submersible, and pressure washer capable. The cast aluminum housing ensures proper heat dissipation and long-term durability. They are also vibration, shock and EMC tested. The kit includes two 5" LED lights, light covers and wiring harness with pigtail with ground eyelet and blunt cut circuit for power connection. Fits all Jeep Wrangler (JL). 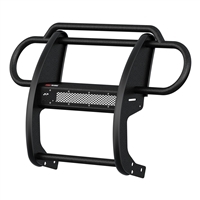 Designed to fit Light Bar, A-pillar or Roof Basket. These lights are offered in a variety of sizes and styles. Packaged in pairs and include wire connectors and lens covers. 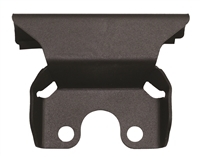 Compliment your RIGID Jeep Wrangler JL Cowl mount with the short standoff mounting option. These mounts are made from laser cut stainless steel and have been powder coated allowing for a clean sleek look. 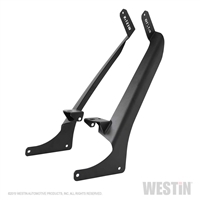 Own The Night with the RIGID mounts for your Jeep Wrangler JL. Made in the U.S.A. and backed by RIGID, lights sold separately. This Center High Mounted Stop Light Relocation kit allows you to add a 35" or larger tire on the spare tire mount and move the CHMSL to the center of the spare tire. Can be used with the Oversized Spare Tire Carrier Modification Kit and / or the tailgate reinforcement system. NVE OFF-ROAD is a Canadian Company based out of Ontario. Get Rugged off-road performance with NVE. Our products are designed for the off roaders, rock crawlers and everyday commuters. NVE set out to create an affordable yet strong and functional line of products. NVE Off-Road accessories are built tough. All bumpers are made with solid steel and powder-coated matte black. Fenders and fender liner are made of aluminum. We at NVE are Jeepers ourselves and know when you are out on the trails you want a brand that you can count on. Keep an eye out for new products as we launch our brand. Follow us on social media, Facebook and Instagram @NVEoffroad. WARRANTY: **BUY AND INSTALL WITH GTA JEEPS AND RECEIVE 1 EXTRA YEAR FREE WARRANTY** TOTAL 2 YEARS!!! If you have "lifted" your Jeep or have a larger-than-stock spare wheel and tire on the back, chances are your high-mount third brake light has either been deleted completely or is not as effective as it once was. Rugged Ridge has the perfect solution to restore your Jeep Wrangler JL to factory safety standards AND increase the cool factor at the same time! The Rugged Ridge Third Brake Light LED Ring adds a surprisingly brilliant ring of torch-red LED's behind your spare tire- guaranteed to grab the full attention of all who are near. Designed to work with various rim diameters from stock to 20-inch diameters, our LED Ring installs easily with the included heat-shrink connectors for seamless performance in all kinds of weather. Transform the frontend of your Jeep Wrangler JL with the Stealth Fighter front bumper. A radius plate steel construction gives your Jeep the perfect combination of strength and style. 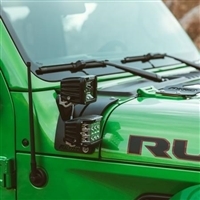 A patented universal light mounting system in the center of the bumper allows you to mount any size and brand of light up to a 20 Inch radius light bar or 5 cube lights. Mounts for two additional cube lights, per side, can be found on the top corners of the Stealth Fighter front bumper to give your Jeep Wrangler additional lighting while off-roading. Two front reinforced clevis mounts accept a 3/4 Inch D-Ring to help out in tough situations. The Stealth Fighter Jeep JL front bumper provides a greater approach angle to maximize off-road performance and an optional top hoop configuration is available for additional protection. Available in both winch and non-winch configurations for Jeep enthusiasts who need the added utility. This completely bolt-on Jeep Wrangler JL front bumper comes in hammer black powder coat with satin black powder coat panels. Along with its hardy construction, tough-as-nails powder coat finish and vehicle-specific design, the ARIES Pro Series™ grille guard features a patented crossbar to house a single-row LED light bar. The crossbar comes with an included 20" light bar #1501262 and can also accept other LED light bars using the slotted 20" channel bracket. The Pro Series™ grille guard also features an ARIES-exclusive interchangeable cover plate to protect the light and create a custom look for the front end of your truck. Like our standard grille guards, ARIES Pro Series™ grille guards are vehicle-specific, providing a seamless fit and contouring perfectly to the profile of your vehicle. They use a no-drill mounting system for easy installation and come with a unique textured black powder coat finish for long-lasting rust and weather resistance. NOTE: Some 20" light bars may not fit the channel bracket. 2018 Jeep Wrangler JL & JLU Hood Hinge Light Mount for a 20" Single Row LED Bar. 2018 Jeep Wrangler JL & JLU Hood Hinge Light Mount for two 6" Single Row LED Bars, driver & passenger hood hinge kit. 2018 Jeep Wrangler JL & JLU Windshield Cowl Light Mount for two 3" X 3" industry standard cube LED's, kit includes mounts for both driver & passenger windshield cowl. Mounts 2 cube lights at 2 different elevations creating a stacked effect. 2018 Jeep Wrangler JL & JLU Hood Latch Pod Mount Kit Single 3" x 3" Cube LED , driver & passenger hood latch kit. Jeep Wrangler JL & JLU Hard Top Rear Light Mounts for two 3" x 3" LED Cube Lights. Mounts are no drill and mount to factory rear lift glass hinges. Perfect for trail rides and camping or whenever extra rear facing light is needed. Order online or pick up & have it installed locally in Brampton, ON for 2 YEAR extended warranty. Having trouble seeing the road ahead at night and the halogen bulbs are not cutting it. Make an upgrade with the Mopar LED Headlights for your Jeep Wrangler JL. Delivering a brighter and lighter white light output providing better visibility and a safer experience. Since these LED headlights are made by Mopar they are a direct plug into the factory original wiring harness with ease. 12 Month / 12,000 Mile Limited Warranty. 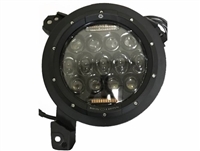 Jeep Wrangler JL 2018, 7" Round Projector LED Headlights with RGB Accents by Iron Cross, 1 Pair. Black housing, clear lens. This product is made of high-quality materials to serve you for years to come. Designed using state-of-the-art technology and with customers in mind, this product by Iron Cross will last a lifetime. It will meet your needs and deliver great quality at an affordable cost. This innovative kit mounts a single 50" or 52" LED Light Bar at the roof level for a 2018 Jeep Wrangler JL. Custom made to ZROADZ specifications with precision laser cut steel, pressed and formed to our tooling fixtures and powder coated black. COMMAND THE DARK with Rough Country's 30in LED Hood Kit!This awesome, easy-to-install LED upgrade gives your Jeep JL a menacing look and incredible off-road illumination.This kit features Rough Country's 30in, straight, single-row LED light bar for a sleek look that leaves plenty of visibility while blending in perfectly with the JL's aggressive front-end design. This setup provides a staggering 12,000 lumens and 150 watts of forward-facing LED power and is available in your choice of Chrome-Series or Black-Series LED for the style that suits your build the best!Each Rough Country LED light bar is IP67 Waterproof and includes a premium, braided wiring harness with in-line fuse and on/off switch!This easy-to-install kit features a 100% bolt-on installation procedure, with no need for cutting or drilling on your brand new Jeep, and does not interfere with the windshield washer nozzle or spray pattern!Includes Rough Country's 3-year LED warranty and lifetime mounting bracket warranty!